We initiated an earthquake reporting project in 2016 to collect field observations of ground damages caused by large earthquakes from trained volunteers and interested citizens. After a potentially damaging earthquake occurs in the Taiwan area, our system, the Taiwan scientific earthquake reporting system (TSER), would send a notice to the participants, who are encouraged to visit the epicentral area to survey and describe in as much detail as possible the variations of the ground damages using a Usahidi-based mapping platform. They may also upload relevant images in the field when the condition permitted (i.e., good mobile signal). This collective information will be shared with the public after a quick check by the on-duty scientists. Statistically, in Taiwan damaging inland earthquakes, e.g., magnitude greater than 6, occurred every 2–3 years. During the intermittent time, the platform serves to share educational materials such as pictures of geological structures and landscapes, which are beneficial to many of the volunteers, who are high school science teachers. 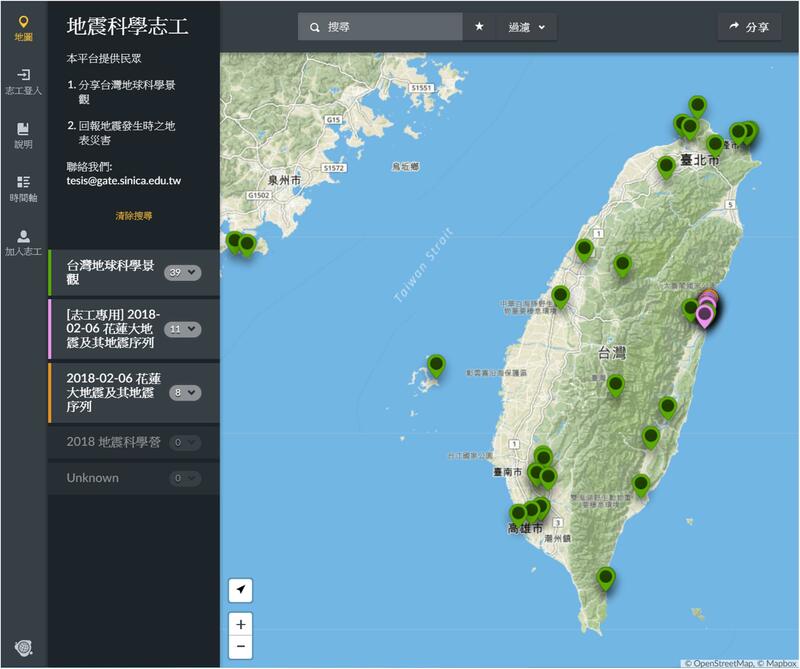 This experimental, science-oriented crowdsourcing system was first tested during the February 6, 2018 Mw 6.4 offshore Hualien, Taiwan earthquake. We received 19 field reports in the first 3 days after the earthquake. Most of these reports provided surface damage details along the Milun fault, which also ruptured during the 1951 ML 7.1 Longitudinal Valley earthquake sequence. The crowdsourcing approach of TSER has proven to be effective in enhancing public awareness and the potential for scientific advancement in hazard mitigation. Being located at the tectonically active boundary between Eurasian and Philippine Sea plates, earthquakes occur frequently, and the associated surface deformation is significant in the vicinity of the island of Taiwan (Figure 1). According to the newly published probabilistic seismic hazard analysis (PSHA) results (Wang et al., 2016), the probabilities of occurrence of the earthquakes larger than moment magnitude (Mw) 6.0 are higher than 20% in the next 30 years for multiple seismogenic structures (i.e., active faults) in Taiwan. Historically in September 20 of 1999, the Mw 7.6 Chi-Chi Earthquake hit central western Taiwan and the surface rupture extended for about 90-km long along the Chelungpu fault. The co-seismic surface offsets on the fault increased from 1 to 2 m in the south to 6–8 m in the north, as revealed by fault scarp measurements (Central Geological Survey [CGS], 1999; Lee et al., 2002; Lee and Chan, 2007). The severe ground shaking caused by this disastrous earthquake also triggered several fatal landslides (e.g., Chang et al., 2006; Tang et al., 2009), one of which formed a dam lake in the Tsaoling area (e.g., Chen et al., 2006). In addition, soil liquefaction had been widely observed in the coastal plain (National Center for Research on Earthquake Engineering [NCREE], 1999), where the surface is covered by immense late Quaternary soft deposits. The landscape shaped by the 1999 Chi-Chi Earthquake had a great impact on both society and research community of Taiwan. Figure 1. Distribution of the large earthquakes greater than ML 6.0 which occurred in the Taiwan area in the past 28 years (1991–2018). Symbol size represents the magnitude, whereas the color indicates the earthquake focal depth. 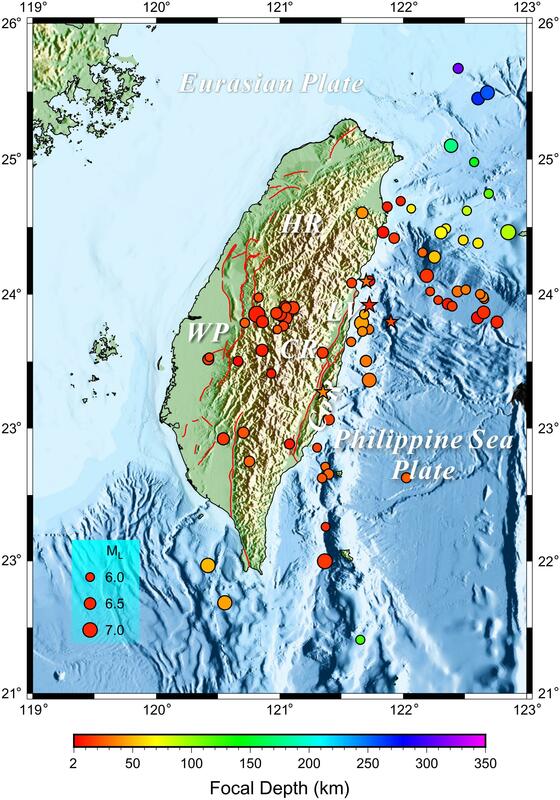 Although more than a half of the earthquakes occurred in the offshore area, there were still 26 damaging large earthquakes ruptured underneath the inland Taiwan. Epicenters with ML > 7.0 in the 1951 Longitudinal Valley Sequence are shown in red starts. Red lines mark the surface traces of 33 active faults, which were announced by the Central Geological Survey of Taiwan. Geological terranes: WP, western coastal plain and foothills, HR, hsuehshan range, CR, central range, LV, longitudinal valley, CoR, coastal range. Although dense instrumental seismic and geodetic networks have been implemented in Taiwan in the past decades (e.g., Institute of Earth Sciences, Academia Sinica, Taiwan, 1996; Hsiao et al., 2009), some earthquake induced ground damages, such as surface rupture, landslide, rock fall, liquefaction, and landslide-triggered dam lake, etc., may not easily be identified by seismic instruments right after the earthquake. In order to rapidly collect field observations on earthquake triggered surface damages which could possibly be hazardous, immediate or long-term, to public, we have launched an experimental program in 2016. In this project, we incorporate (1) computer-aided volunteer management system (VMS), (2) educational training course and (3) online report and mapping platform. The success of this program replies on not only the quantity and completeness of collected witness reports, but also their quality and reliability. Therefore, encouraging people, in particular trained volunteers, to participate in reporting the earthquake damages during seismic events is crucial. In the past few decades, some crowdsourcing projects either spread questionnaires (e.g., Ward et al., 1999) and/or relevant cartoons (Bossu et al., 2018), so that volunteers can report their experiences during or after a felt earthquake. These platforms or Apps allow all volunteers to submit their earthquake experiences without, however, providing associated educational trainings for necessary scientific knowledge or skills. Since we are aiming to collect scientific information in terms of earthquake induced surface damages, it might require necessary scientific knowledge or skills to carry out this kind of field observations and investigations. It is, thus, important to build up knowledge capacity for volunteers to meet this goal. As a result, we designed a series of training courses with relevant topics, including regional and local geology, historical earthquake, geohazards and so on. Meanwhile, we have been constructing the Taiwan scientific earthquake reporting (TSER) system. We adopted the pre-existing Ushahidi mapping platform1, which has been widely used on crowdsourcing and had some success in different purposes. Participants may add an APP-like icon of the website on their mobile devices2. When a potential damaging earthquake occurred in the Taiwan area, trained volunteers will be notified within one or two days. The email notification would guide the participants to the epicentral area to carry out field surveys. The participants are then required to submit their reports, including description of surface damages and on-site photography, through this real-time report system. The collected information will be shared with all public after a quick check by the on-duty scientists. In order to attract volunteers as well as letting them be familiar with the TSER platform, we added an additional function on TSER for people, particularly the trained volunteers of school teachers, to post and share landscape pictures (and encouraging with geological explanations) in Taiwan. This is not only to help volunteers get acquainted with this reporting system but also to share any teachable material (see section “Geological Landscape Sharing Mechanism” for more details) on this platform, since a large portion of our trained volunteers are high school or junior high school teachers in natural sciences. This experimental, seismic damages crowdsourcing system was tested during the 2018 Mw 6.4 Hualien earthquake. The earthquake produced surface ruptures 8–10 kilometers long through the city of Hualien and caused a few casualties due to building collapses near the surface fault. We received 19 field reports from volunteers, including two anonymous, interested citizens, in the first 3 days following the earthquake. 17 out of the 19 reports were given on different sites along the Milun fault, which was apparently triggered by the earthquake. It is also worth noting that historically the fault ruptured during the 1951 ML 7.1 earthquake (Hsu, 1962; Figure 1). Although similar observations have been provided by other scientists in the following days and weeks, the accounts from the local volunteers obviously have given a reliable rapid report and surface evidence in a scientific way. In short, for the case of the Hualien earthquake, the TSER platform provided not only the distribution of the surface ruptures, but also rupture orientation, type of faulting, and offset dimension (see section “2018 Mw 6.4 Hualien Earthquake: a Test of Real Case”). However, the experiences from this earthquake show that we were still short of trained volunteers in the Hualien area, partly because eastern Taiwan is not populated as western Taiwan (only a few high schools in the area). Nevertheless, we have shown that this TSER system, relying on enthusiastic participation from trained volunteers and general public, is workable during damaging earthquakes. Some technical issues were found during the 2018 earthquake, such as real-time GPS location, image (photograph) size limitation, and menu options, giving us indications to improve. Also, additional knowledge regarding the impacts imposed by historic earthquakes and robust earthquake preparedness should be included in our future training courses. The ultimate goals are to enhance the public awareness of earthquake hazards and to promote citizen seismology in Taiwan. Taiwan scientific earthquake reporting is a crowdsourcing system designed for collecting quantitative descriptions from trained volunteers and general public for earthquake triggered surface damages. We incorporated this system to work together with other well-developed pre-existing facilities at earthquake science community in Taiwan (Liang et al., 2016, 2017). We intend to build a framework to promote public involvement in better understanding earthquake science and improving hazard mitigation. According to the earthquake catalog from the Taiwan Central Weather Bureau (CWB), 101 earthquakes with a local magnitude larger than 6 occurred in the vicinity of Taiwan in the past 28 years (i.e., 1991–2018) (Figure 1). Among them, 26 shallow crustal events (i.e., focal depth <30 km) ruptured underneath inland Taiwan. Although not every event ruptured to the surface, the island of Taiwan was hit by a severe earthquake (M > 6) almost every 2–3 years in average (Liang et al., 2017). The newly published seismic hazard maps in the Taiwan area (Wang et al., 2016) indicate the highest hazard probability is evaluated to be in two areas: (a) Southwestern Taiwan and (b) the Longitudinal Valley of Eastern Taiwan, which is comparable to the distribution of historic large earthquakes as shown in Figure 1. Most of the identified seismogenic structures or active faults (Wang et al., 2016) are located close to the populated area (Figure 1). As a result, nearby, well-trained, educated volunteers could play an important role in collecting key features caused by any damaging earthquakes to complement the real-time instrumental data. One major concern is that the safety of volunteers must be secured first. To achieve so, we provide a security guide for volunteers to take necessary actions before and during conducting field investigations. The principle is to keep our volunteers away from any places at high aftershock risks and stay safe. As geoscientists, we need to combine the field observations with those from the real-time instruments (e.g., seismometer, GPS, etc., Lee et al., 2013; Wu et al., 2013, 2016, 2018; Jian et al., 2018b), in order to determine the responsible structure(s) and the impact of the possible related hazards. These firsthand rapid eyewitness reports will enable appropriate site selection for further sophisticated geological field investigations and also enrich our knowledge database. The question is: how to proceed to make sure the field damage information will be fulfilled in TSER system during disastrous earthquake event? The key points include (1) to encourage public involvement in this program and (2) to build up the knowledge capacity of volunteers. Also (3) we need to establish an online web platform so that trained volunteers and general public are able to report field observations without difficulties. In order to do so, we designed a computer-aided VMS, a series of training courses, and a Web GIS-based crowdsourcing platform for this particular need. Figure 2 is a workflow diagram illustrating the rationale of this TSER system. Table 1 is the summary of main working items that were involved in this program. We believe the enthusiasm, willingness and reliability are critical to the success of this crowdsourcing system. For future perspective, to keep our volunteers engaged and inspired, we think some recognition mechanisms, such as contribution acknowledgment, success stories sharing and regular communication, are rather important; thus, the associated functions in TSER are now under construction (we shall discuss this in more details in Section “Current Status and Future Perspective”). Figure 2. A workflow diagram illustrating the rationale of the Taiwan earthquake scientific reporting (TSER) system. Yellow boxes indicate those actions taken by scientists involved in this project. Green boxes show three major components (see main text) developed in this project. Blue boxes represent the way that untrained volunteers may contribute to this project. Table 1. Summary of the working items for Taiwan scientific earthquake reporting system. As mentioned above, in order to collect rapid scientific information for earthquake triggered or induced natural surface damages, it is important to build up the knowledge capacity for volunteers. As a consequence, we have designed a series of training courses with relevant topics, including (1) an overview of Taiwan tectonics and geology, (2) historic earthquakes and associated surface damages, (3) geohazards of Taiwan, (4) introduction of TSER and volunteer reporting system, (5) citizen seismology, and (6) field geology excursion with on-site reporting practices. We invited dedicated 6–8 scientists including university professors to contribute lectures for these courses. We organized this kind of training course in three consecutive years of 2016, 2017, and 2018, although the one in 2018 was postponed last minute due to typhoon. The first training course was held at Taipei in 2016. A total of 72 participants, mostly high school teachers, joined a 3-day workshop, including a 1-day field trip. We found that the majority of participants came from northern Taiwan. As a result, the 2nd training course was held in the city of Tainan in southwestern Taiwan in 2017. Indeed, this workshop received 30 participants, among whom 27 came from southwestern Taiwan. We followed this strategy for moving the location of the training course. In 2018, the 3rd training course was set to be held in the city of Hualien in eastern Taiwan. As mentioned above, the workshop unfortunately was forced to be postponed due to typhoon Maria. Here, we show an example of the training course at Tainan in 2017 in more detail3 in Chinese. In this workshop, we focused on earthquake science education (i.e., topic #5) in Day 1 and presented topics #1, 2, 3, and 4 in Day 2. In Day 3, we organized a geological field excursion in the nearby foothills area of Southwestern Taiwan, where a young, active fold-and-thrust belt is still developing. It is also near the epicentral area of the 2016 Mw 6.4 Meinong earthquake, which caused significant surface damages in several places. Related handouts are accessible in the links listed inside the agenda table. Figure 3 shows the photographs that were taken during this training workshop. In Figure 3A, participants were playing with a board game designed for learning knowledge about local earthquakes as well as the ways to mitigate the associated hazards. Basic seismological observations and local active faults were introduced by experts as shown in Figures 3B,C. Figure 3D presents a photograph taken in the Tsao Shan Moon World, a tract of barren land (badland) formed within the mudstone region during the field excursion. We also let the participants practice the TSER damages reporting system during the field trip. Participants were requested to submit their observations with their mobile phone in the field. Some examples can be found at http://tesis.earth.sinica.edu.tw/TSER/. This package of teaching material has been archived in our database and continues to be updated and integrated in the platform. Figure 3. Photographs illustrating activities and highlights of the 2017 training workshop. 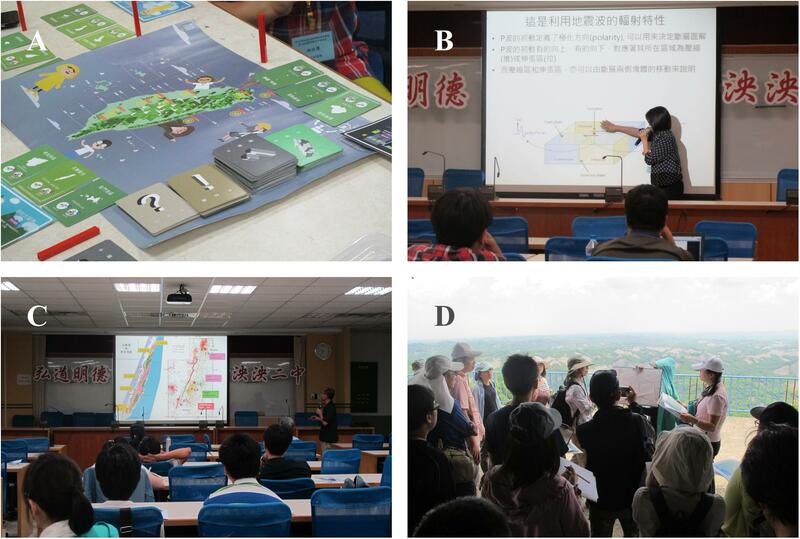 (A) A board game designed for learning knowledge and hazard mitigation for earthquakes and extreme weather in Taiwan. (B) Lecture introducing basic knowledge of seismology. (C) Lecture explaining active faults and earthquake triggered geohazards. (D) photograph taken in the field excursion around area of badland mudstone, where different earthquake-triggered damages could potentially occur. (Written informed consent were obtained from participants that may be identifiable in this figure). We have been working together with the researchers and technicians of computer sciences at the Institute of Information Science, Academia Sinica to develop a VMS. TSER is one of the projects at Academia Sinica which intend to use crowdsourcing data for disaster risk reduction. This VMS archives contact information of volunteers and allows them to participate in multiple projects. When the potentially hazardous earthquake occurred, our VMS will send an alert or notification to volunteers who have expressed their willingness to help collect field observations in the epicentral area of the target earthquake. This notification reminds volunteers to stay safe in any case. A security guide is provided for volunteers to take necessary actions before and during conducting field investigations. If possible (e.g., they are close to the affected region), they are encouraged to help conduct field observations at their convenience. In order to protect the privacy of volunteers, we do not actively collect their location coordinates unless they took our request and recorded their eyewitness reports. The reliability weighting of individual volunteers depends on the frequency he/she has participated in the training workshops organized by the TSER program. To attract more qualified, educated volunteers, we were targeting mostly on high school teachers in natural sciences. We collaborated with the Fundamental Earth Science Education Resource Center, an official association of high school teachers in Taiwan, to co-organize the aforementioned training workshops for high school teachers. We also encourage them to play as seed volunteers in their schools. In the future, we have a plan to broaden the participation from high school teachers to university students through multiple events, such as annual open-house activities of Academia Sinica, educational conferences and related school activities. 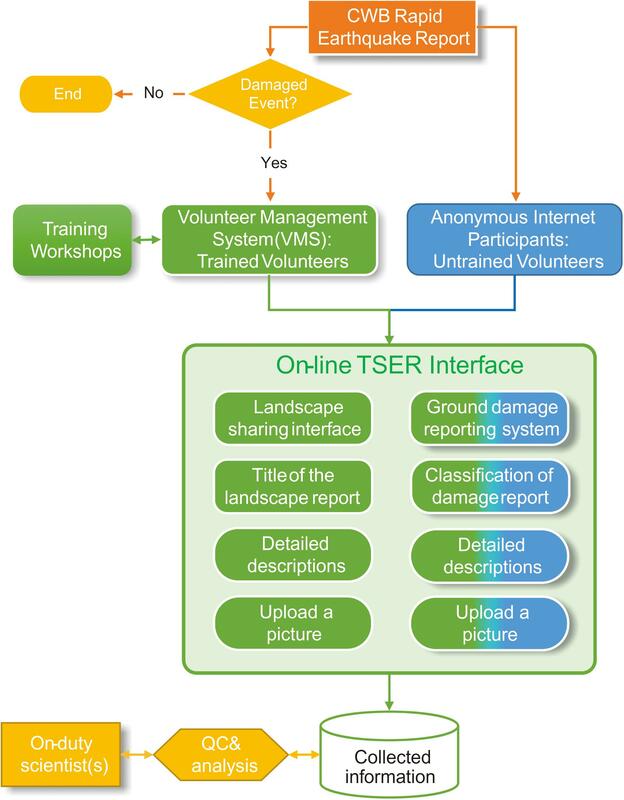 As revealed in our previous work (Liang et al., 2016), to continue to keep their interest in participating the TSER program for individual volunteers is a challenge, which needs to be further addressed. Based on our experience by interviewing workshop participants, we understand that providing effective recognition might be a valuable reward to volunteers. We shall put related functions in TSER or organize activities on our next working list, such as a credit ranking, top gorgeous pictures award in the year, geological field excursion routes design, and so on. We may also provide certificates to dedicated volunteers in a formal way to express our appreciation and encouragement. Here we illustrate the current design of TSER portal page (Figure 4). The leftmost column listed basic functions, including Map, Login, Instruction, Time line and Registration, from top to bottom. Adjacent to its right, the brief contact information is presented on the top, followed by on-going project names. In this example, on-going projects include (1) Geological Landscape in Taiwan and around the world, (2) Volunteer Reports for the 2018-02-06 Hualien Earthquake, (3) Public Reports for the 2018-02-06 Hualien Earthquake, and (4) The 2018 volunteer training workshop, which are labeled with green, purple, orange and red colors, respectively, from top to bottom. Once the user clicks on any of the projects, “the sites of interest” will appear in the map of the main frame. Figure 4. The home page of the TSER portal page. Each small balloon represents geographical site of individual reports for either earthquake-triggered surface natural damages (pink color) or geological landscape (green color). For instance, we received 19 reports in total from Projects (2) and (3) for the 2018 Mw 6.4 Hualien Earthquake. For project of geological landscape, so far there are 39 worldwide pictures of landscapes post on this platform. All the locations of these landscape photos are presented on the map in the main frame. Only registered volunteers are able to login to submit their landscape images in order to prevent malicious attacks on the Internet. On-duty scientist(s) would then examine submitted materials and modify them if necessary. Clicking on each project will enable or disable the corresponding views on the map. To record eyewitness reports for a particular project, registered volunteers have to log into the TSER platform either on a mobile device or on computer. For reporting earthquake-induced surface damages, they are required to fill or select items during their surveys, including (1) identify the ground damage category from a menu (among surface rupture, mudflow/debris flow, landslide, liquefaction, mud volcano eruption, and others), (2) briefly describe this natural ground damage (e.g., length, width, orientation, etc. ), (3) locate this damage by clicking the observation point on the map, and (4) upload a picture taken from their phone/camera and indicate the corresponding viewing orientation (i.e., azimuth). Volunteers are allowed to modify their reports to correct typos or unintentional mistakes. The platform also registers every step (movements) volunteers have made, so we can back track the records. As mentioned above, in average a damaging earthquake (e.g., magnitude greater than 6 with shallow focal depth) has occurred within inland Taiwan every 2–3 years during the past three decades (e.g., Cheng and Yeh, 1989; Liang et al., 2017). To help volunteers to be accustomed to the online reporting system, we designed a geoscientific landscape sharing interface for users to view and upload images with short descriptions. Whenever the volunteers (e.g., as school teachers) find a spectacular or remarkable natural landscape, the system encourages them to post the photography (with some descriptions). The procedure of using this interface is very similar to the one for reporting earthquake triggered ground damages, with four simple steps: (1) identify the category of this landscape, (2) describe the geological/geographical characteristics of the feature, (3) locate this landscape by clicking the observation point on the map, and (4) upload an image associated with this witness report. These pictures and corresponding reports will be examined by on-duty scientist(s) before open to the public. We expect that these kinds of information will be beneficial to teachers and students for educational purpose. For example, one can design a suitable field trip itinerary for learning local geological features based on the reported landscape sites. To expand our database, we are planning to collaborate with universities in which the geological field training and short courses are provided for students. This is not only to enrich the archived geoscience landscape images, but also to promote the public involvement in this citizen science activity. For example, volunteers from school teachers are able to find local, teachable material, such as images, locations and descriptions for a specific geological structure with the help of searching keywords through this system. Figure 5 is an example demonstrating an image of a normal fault taken in northern Taiwan. A sub-vertical normal fault plane offsetting the sedimentary strata of Miocene-Pliocene Tapu formation is well illustrated in this example. 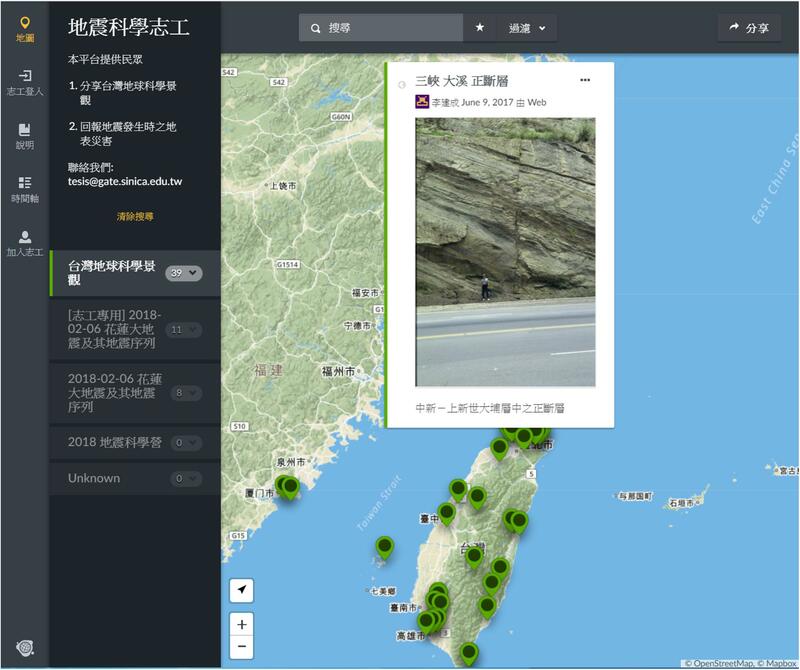 One can learn the characteristic geological features in Taiwan from accumulated information shared in this platform. Eventually a customized geology field trip route with explained highlighted sites can be planned based on TSER’s archive. Figure 5. An example illustrating a geological landscape reported in the TSER system. The information includes name of the landscape feature (normal fault), location, post by whom and date, the associated photography or image, and descriptions of the key features in landscape. A shallow earthquake with Mw 6.4 and focal depth of 15–18 km hit eastern Taiwan at 23:50 (UTC+8) on February 6th, 2018 and caused the collapse of several buildings in the City of Hualien, in which 17 people were killed and 285 injured4. The location of the hypocenter estimated by CWB was about 18–20 km to the north of Hualien City in the offshore area. The maximum Taiwan ground seismic intensity was seven, which is relevant to MMI scale of VIII (severe). The aftershock activities spread out toward south in the first few days after the main shock, whereas a large “foreshock” with ML 5.8 occurred near the main shock 2 days before (Kuo-Chen et al., 2018). The latest research results argued that there might be multiple faults ruptured following the main shock. Meanwhile, the rupture initiated at the north off the coast of Hualien and propagated southward into the Hualien City (e.g., Lee et al., 2018; Jian et al., 2018a). The Milun fault in Hualien is either part of the main faulting plane or dynamically triggered by the main shock faulting (Lee et al., 2018). The observations of the significant surface deformation along the Milun fault were revealed by field geological investigations (Central Geological Survey [CGS], 2018; TSER platform), InSAR satellite imagery (Yen et al., 2018), and GPS measurements (e.g., Kuo et al., 2018). The collected rapid observation of surface rupture traces did provide a constraint that is comparable to the inferred source model of the triggered Milun fault by Lee et al. (2018). Significant surface ruptures along the Milun Fault were documented by scientists during the field investigations following the earthquake. Soil liquefaction and ground settlements during this earthquake sequence have also been reported based on field surveys (Ko et al., 2018). Rockfalls were reported at the Suao-Hualien Highway No. 9 and Highway No. 8 in the Taroko National Park (two were killed), north of Hualien city. Although these researches present detailed scientific information related to the 2018 offshore Hualien earthquake sequence, the impact is not as strong as the rapid results carried out from some real-time operating systems, such as the Taiwan earthquake scientific information system (TESIS, Liang et al., 2017). This TESIS webpage collects the rapid earthquake report issued by CWB and many other near real-time scientific results from various organizations in Taiwan. These pieces of near real-time information are all derived from sensor data, such as intensity maps, focal mechanisms, and associated seismic waveforms. In addition, some background geospatial data, including geological maps, active faults and inter-seismic GPS vectors are accessible. These allow correlation between responsible seismogenic structures, and the earthquakes, and evaluation of the impacts that the earthquake might cause. Coming back from the TSER reporting system, we received 19 reports in the first 3 days after the main shock. The interesting thing is that all these reports were submitted at locations along the Milun fault, which was previously ruptured in 1951 magnitude 7.1 earthquake in the Hualien area (Figure 1; Hsu, 1962). Figure 6A shows the location distribution of these 19 witness reports and two other landscape reports at the southern edge of the map. The surface trace of Milun fault roughly follows the marks of the arc-shape location of submitted reports (Figure 6B). It shows that the reported locations of the surface ruptures agree rather well with the previously mapped Milun fault, and are thus closely associated with the dislocated fault plane of the earthquake. Several of these field observation reports described both the fault type (left- or right-lateral) and offset amounts (a few centimeters to tens of centimeters) across the observed surface ruptures on human structures. According to the information from these rapid reports, it appeared that the Milun fault was obviously triggered, either dynamically or statically, by this offshore earthquake. As a result, it left significant surface ruptures and damages along the Milun fault (e.g., Lee et al., 2018). Our collected eyewitness reports cover a variety of structural features on the surface ruptures, including pressure ridge of road pavement, offset of bridge floor, dislocation in en-echelon array in the sports ground, building collapses, etc. Prior to the earthquake in 2016, the Central Geological Survey (CGS) had officially announced the Milun fault as the Category I active fault. The CGS also released an avoidance zone within 200 m of the Milun fault (Central Geological Survey [CGS], 2016), in which any new constructions should be prohibited. Whether this governmental enforcement had helped to reduce the earthquake risks during the 2018 earthquake remained to be investigated. Figure 6. 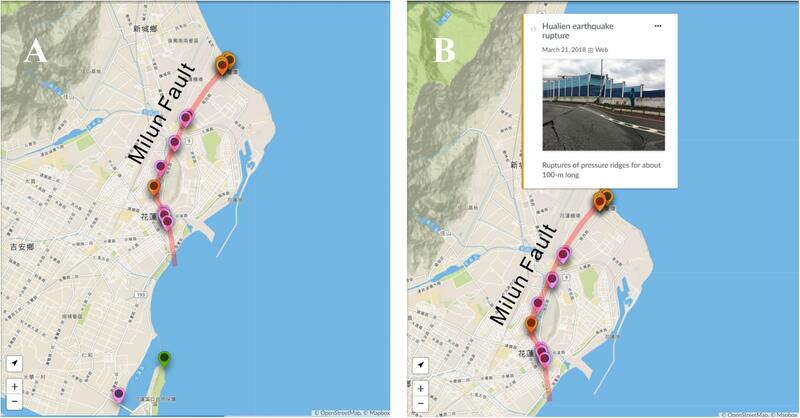 A case study of eyewitness reports during the 2018 Mw 6.4 offshore Hualien earthquake sequence. (A) Among 19 reports, a large portion of the damages collectively marked an arc-shape surface trace, which agrees with the previously identified and mapped Milun fault. We can also find two reports located farther south, indicating other damages existed outside of the Milun fault. (B) A report revealing collapse and offset of the Qixingtan bridge floor close to the northern end of Milun fault. Since 2016, we have provided two training workshops, which had helped a combined number of 102 participants to build up their capacity for reporting appropriate earthquake-induced damages field observations. The third workshop planned in July 2018 was postponed due to typhoon Maria, and will probably be re-scheduled in 2019. So far, 60 of 102 participants applied as volunteers in our management system. Most of these volunteers are from urban areas in western Taiwan. As mentioned above in Section “Rationale of the Taiwan Scientific Earthquake Reporting (TSER) System”, to keep volunteers engaged and inspired, we are now working on designs of (1) online training courses, (2) contribution acknowledgment, (3) social interaction, (4) sharing of success stories, and (5) friendlier TSER interface. In addition, we are planning to regularly highlight nice examples of named eyewitness reports on a blog page. A Q&A page is also considered, which is likely helpful to improve the system, either on a web-based blog or on social media. The reliability of an upload report might depend on the poster’s capacity, which is why we put great efforts on educational training workshops. However, the general public with basic scientific knowledge may help as well. As a result, in practice we also open this TSER reporting system to the general public who are interested in sharing their eyewitness reports during damaging earthquakes. The scientist(s) on-duty are responsible for validating these reports as quickly as possible. In the first phase of this project, only registered volunteers have been dispatched by a notice sent out through the VMS. In the next phase, this notice will be disseminated through all available channels. We welcome anonymous volunteers to join in with this project. Meanwhile, not only will the ground damage be reported, induced damages of the built environment are considered to be included as well. In fact, these damages usually account for most of the social impact from a disastrous earthquake, rather than the ground damage. In the 2018 Hualien earthquake case, we received two reports with pictures of building collapse, where major injuries and fatalities occurred. We initiated a citizen seismology program (TSER platform project), incorporating training courses and VMS with the web GIS-based platform, to crowdsource scientific eyewitness reports for earthquake triggered surface natural damages. By collecting the on-site field reports, we intend to complement the field ground observations with the real-time instrumental data and results, to better understand the surface damages and geohazards caused by large earthquakes. We feel it might be of great potential to help rescue and better assess the social impacts. In order to keep the volunteers familiar with the reporting system and its procedure, we designed a geological landscape posting/reporting mechanism for volunteers. This is also beneficial to the volunteers, since most of them are high school science teachers. Volunteers who have participated in our training workshops may have a higher weighting on the reliability of their reports. The VMS will automatically notify and dispatch registered volunteers when a significant earthquake happened underneath inland Taiwan. This still-developing TSER system was tested in the real case of the 2018 Mw 6.4 Hualien Earthquake. The crowdsourced eyewitness reports, although not abundant, indeed showed a heavily damaged zone along the Milun fault, which had been historically ruptured during the 1951 earthquake sequence. We are continuing to take care of the recognition for volunteers in order to promote broader future public involvement in this program. This work will collect only eyewitness reports from scientific volunteers. The privacy protection and information security policy of Academia Sinica is strictly followed. No individual information will be collected from the developed platform. In this case, a formal approval from an ethics committee is not required as per the local legislation. Written informed consent were obtained from participants that may be identifiable in Figure 3. W-TL and J-CL conceived the system development. N-CH assisted with the real-time earthquake alert from the Central Weather Bureau. W-TL drafted the manuscript. J-CL supervised the findings of this work and oversaw the revisions. This work was supported in part by the “Disaster Resiliency through Big Open Data and Smart Things, DRBoast” project (Grant No. : AS-105-SS-A03) (Funding Agency: Academia Sinica), as well as the Taiwan Earthquake Research Center program (TEC) (Grant Nos. : MOST 106-2119-M-001-021 and 107-2116-M-001-023; TEC Contribution Number for this article is 00148) (Funding Agency: Ministry of Science and Technology of Taiwan, MOST). This is a contribution of Institute of Earth Sciences Academia Sinica, IESAS-2372. We are grateful for many constructive comments and suggestions of the two reviewers, Dr. Ban-Yuan Kuo and the editor, which substantially improved this manuscript. We thank Ms. Chi-Fang Lee for her great support on the technical development of the Ushahidi interface. We are also grateful to have the TEC office staff offered tremendous help for training workshop assistance and for testing numerous times on the reporting system of this platform. Central Geological Survey [CGS] (1999). Report of the Geological Survey of the 1999 Chi-Chi Earthquake (in Chinese). Taipei: CGS. Central Geological Survey [CGS] (2016). Central Geological Survey. Available at: https://www.moeacgs.gov.tw/newlaw/downloads/announcement/1051221/F0011/F0011%E7%B1%B3%E5%B4%99%E6%96%B7%E5%B1%A4%E5%8A%83%E5%AE%9A%E8%A8%88%E7%95%AB%E6%9B%B8.pdf (accessed April 5, 2019). Central Geological Survey [CGS] (2018). Report of the Geological Survey of the 20180206 Hualien Earthquake (in Chinese). Taipei: CGS. Cheng, S. N., and Yeh, Y. T. (1989). Catalog of the Earthquakes in Taiwan From 1604 to 1988. Taipei: Academia Sinica, 255. Hsu, T.-L. (1962). Recent faulting in the longitudinal valley of eastern Taiwan. Memoir Geol. Soc. China 1, 95–102. Institute of Earth Sciences, Academia Sinica, Taiwan (1996). Broadband Array in Taiwan for Seismology. Taipei: Academia Sinica. National Center for Research on Earthquake Engineering [NCREE] (1999). Geotechnical Reconnaissance Report of the 9/21 Chi-Chi Earthquake. Taiwan (in Chinese), NCREE-99-053. Taipei: National Center for Research on Earthquake Engineering. Copyright © 2019 Liang, Lee and Hsiao. This is an open-access article distributed under the terms of the Creative Commons Attribution License (CC BY). The use, distribution or reproduction in other forums is permitted, provided the original author(s) and the copyright owner(s) are credited and that the original publication in this journal is cited, in accordance with accepted academic practice. No use, distribution or reproduction is permitted which does not comply with these terms.